This is the ninth of a 12-part, once-a-month series on the Fruits of the Holy Spirit. This month’s fruit is FIDELITY. Be sure to see previous posts beginning with CHARITY and check back next month as another contributor explores the fruit of MODESTY. Occasionally, the parables Jesus use fall a little flat to our modern ears. Of course, that does not render them irrelevant, but sheds light on our own shortcomings. I had to finally admit to myself that I would not probably care that much about one sheep out of a hundred who ends up straying from the group and getting lost. Would I leave the sheep and go off into the wilderness in search of that missing one? With most of the group intact and numbers practically the same, it’s hard for me to imagine going out of my way for one sheep. Rejoicing now in my own inability to completely relate to these two parables, I am left with a stark and heightened awareness of the difference between my fidelity and Jesus’ fidelity. I should be on my knees thanking God that His attitude toward me is not like my own toward that one stray sheep. Jesus would go find me. He would pick me up and sling me over His shoulders. Not only that, He rejoices with His friends in heaven, the saints. The parables are a beautiful illustration of His fidelity, or faithfulness, this very gift He seeks to impart to us as one of the fruits of the Holy Spirit. What are the ways in which we overlook our lost brothers and sisters, the ones who have fallen away from the faith, or who have never found Him to begin with? How about the ones who are struggling in the midst of challenges, existential crises, emotional turmoil leading to a tepidity of faith, or distrust in God? Jesus is looking for them. Are we? Are we so faithful that we will drop what we are doing to go tend to that one sheep, look for that lost coin? Do we sincerely rejoice when our brothers and sisters get found, find solace, healing, renewed faith? Equally as important, do we maintain hope and continue to lift up our suffering brothers and sisters in prayer? It is easy to throw up our arms and assume the sheep is lost—the wolves have eaten him. What’s the point? we think. Why risk our own lives, our own comfort, our own security? 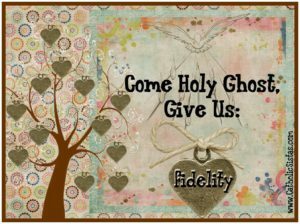 Let us pray for fidelity during this Year of Faith.